Do you need some additional comfort for your bed, but don’t want to purchase a whole new mattress? Then a mattress topper might be the perfect solution for you. 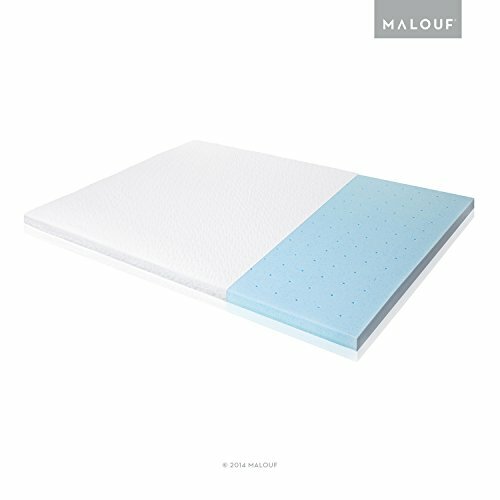 Mattress Toppers, Pads, Encasements, or Protectors? Who can Benefit from a Mattress Topper? 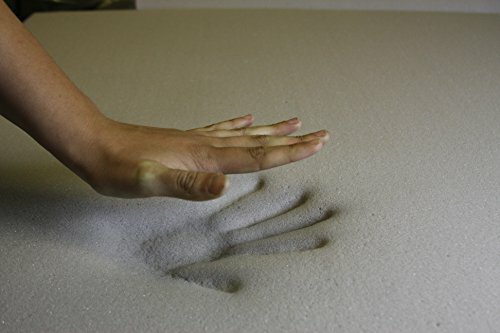 Our top pick for the best memory foam topper is the Memory Foam Solutions 3-inch Topper. This option conforms to the body for comfort and has a reasonable price. 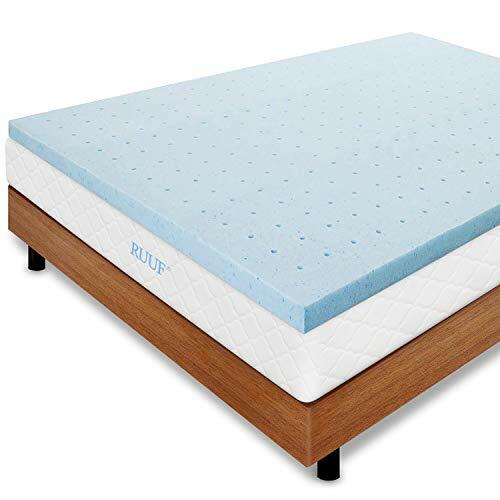 Our favorite runner-up choice is the RUUF 2-inch Mattress Topper, which has cooling properties and a budget-friendly price. Before you choose, though, you’ll want to get some facts straight about mattress toppers. This includes information about toppers versus protectors, pads, and encasements, the benefits of owning a mattress topper, and other useful information. Memory foam toppers are the most popular kind of topper on the market and many owners mention that this additional layer adds support, comfort, and pain relief. Like the mattress industry, the market for mattress toppers and similar products is vast. This can make it hard to shop with any peace of mind because you might wonder if you could’ve made a better choice. We’re here to clear up any confusion you might have about this topic, so you can make the right decision. Here are some key differences between mattress toppers, pads, encasements, and protectors. Mattress toppers are the most luxurious and also the most expensive out of mattress toppers, pads, encasements, or protectors. This is because they tend to be more durable and made of higher quality materials. They also come with a wider variety of choices and tend to last longer. Mattress pads are usually cheaper than toppers and don’t tend to offer the same comfort or support as a mattress topper. One benefit to choosing a mattress pad to add comfort to your mattress, though, is affordability. Mattress encasements are more about cleanliness and protection than comfort, although they do sometimes come with additional foam for cushioning. Adding an encasement to a mattress can protect it from bed bugs, dust mites, or other pests and are often used in hotels. Mattress protectors are different than the other three options because these exist only to protect a mattress and don’t come with any pain-relieving or supportive benefits. They can protect a bed from water and pests and can also provide hypoallergenic benefits. Reviving an old mattress – As your mattress advances in age, it could lose its cushioning support. While a topper won’t completely restore your bed, it can buy you some time before you have to buy a whole new mattress. Reducing firmness – If you just got a mattress that feels a bit too firm, but you don’t want to return it, a soft topper can fix this and make it comfier for you. Easing tension or pain – Some mattress toppers, especially those made with latex or memory foam, can give your body the pressure relief it needs to recover from pain or daily tension. Just keep in mind that if your mattress is super old or sagging in the middle, a topper may not be enough. The most popular mattress topper material is memory foam, which has unique benefits because of its conforming ability. 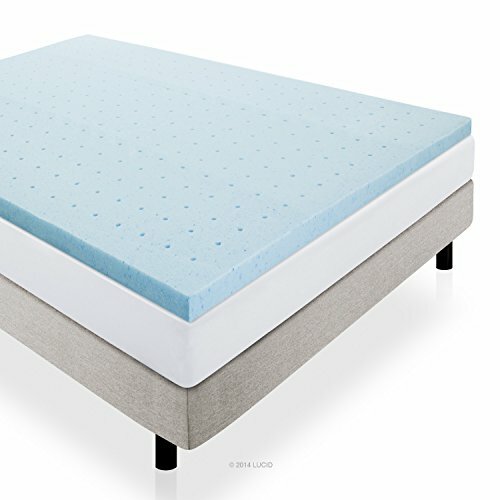 Memory foam toppers come in a variety of thicknesses for tailored support and comfort. Memory foam is comfortable and soft, reduces pressure points in the body, and adds a plush feel to a firm or aging mattress. In addition, a memory foam topper can help absorb motion from a restless partner or pet. Memory foam tends to cost the most when it comes to mattress topper materials, though. Latex is a material with a feel similar to memory foam and is made from either synthetic or natural rubber. Latex is known to promote airflow and doesn’t get as hot as memory foam. It’s a very comfortable material that provides more of a bounce than foam and comes with the benefit of being resistant to dust mites (a common allergen) and mold. Although polyester mattress toppers are the most affordable, they also tend to be the least supportive of all materials. Polyester blend mattress toppers can work in place of a feather topper, for people who enjoy feathers but have an allergy to them. Polyester is inexpensive, doesn’t come with a chemical smell, and can add some softness to your mattress. Feather toppers are a soft and plush option without much support, although some people love the feel of them. This type of topper comes with the benefit of being cheaper than latex or memory foam and provides some soft, extra comfort to your bed. However, the feathers can poke through, which gets uncomfortable, and some people have a feather allergy. People who suffer from back pain, wake up with a stiff neck, or have too firm of a mattress can benefit from a quality mattress topper. If you suffer from fibromyalgia or another painful disorder, wake up feeling tired, or just don’t like the feel of your existing bed, a topper could help. To make your life a little easier, we’ve made a list of the best memory foam mattress toppers on the market right now. 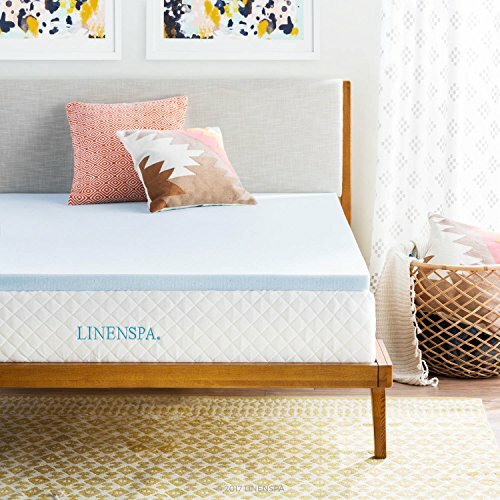 If you’re tired of your mattress and need some relief from pain or tension, but only want a thin topper, this Linenspa 2-inch Memory Foam option might help. This topper responds to your body weight and conforms to your shape to relieve pressure. It’s infused with cooling gel to help you rest at a comfortable temperature and will, as a result, sleep cooler than ordinary memory foam. If you’re looking for a thicker mattress topper, the Sleep Innovations Gel Memory Foam 4-inch Topper may be a good choice. Suitable for stomach, back, and side sleepers, this topper has a washable cover and two layers. It has two inches of quilted fiberfill and two inches of pressure-relieving memory foam. Made in the United States, the Sleep Innovations Gel Memory Foam Topper will come vacuum packed, for easy delivery. People who get hot in their sleep should be careful when they select a topper, as the wrong choice can make this problem even worse. If you struggle with waking up sweaty in the night, you’ll probably want to select a gel-infused topper for your bed. Gel infusions help pull heat from your body to keep you resting comfortably. The Lucid 2-inch Gel Memory Foam Topper is ventilated for airflow and further cooling and can soften a firm mattress. If you’re dealing with a bed that’s too firm, a thinner pad, such as the ISOLUS 2-5-inch Memory Foam Topper, can help. This product is gel-infused to reduce heat retention and is also ventilated for airflow. It comes with a removable cover and can help with tension in the body, as it cushions pressure points and allows you to fully relax at night. When you unwrap it, give the topper 24 hours to expand to its full size. If your main concern is revamping your current mattress because it’s wearing out, you may do well with this 3-inch topper from Memory Foam Solutions. It uses extra supportive foam that conforms to your body, reducing pressure points and potentially easing tension. Note that some users report a strong off-gassing odor with this topper, so you may need to let it air out in a ventilated room to get rid of the smell. You don’t have to spend a fortune to get a good mattress topper. This 2-inch memory foam layer can add some pressure relief and comfort to your existing bed without breaking the bank. It comes with a gel-infusion to prevent heat from building up and open cells that promote airflow. The material will distribute your weight as it contours to your curves, possibly easing back pain. Choosing the right mattress topper will require some consideration of certain factors. Below, we’ll discuss some of these, so you can be assured that you made the right choice. Size: Before choosing a mattress topper, you’ll need to think about the size of your bed, to make sure it fits correctly. This shouldn’t be too much of a hassle since toppers come in standard sizes, like Twin, Queen, and King. Try not to use the wrong topper for your mattress if you want to have the best sleep experience you can. Material Quality: Choosing a memory foam topper made from quality materials is necessary both for comfort and environmental reasons. Most modern options will meet certain environmental standards, like CertiPUR-US® certification, which states that the material is free from harmful levels of toxins. Health: The mattress topper you choose can impact your health by providing pain relief and protecting you from allergens. Fortunately, memory foam isn’t a favorable living environment for dust mites. If you’re known to get allergies, it’s worth selecting a hypoallergenic mattress topper, or one that has a removable cover you can wash often. Price: While price does play a role in quality, it’s not always a good indicator of what product will work best for you. It’s more important to look at the specifics of each topper and how well they’ll work for your needs than to only consider the price. That being said, you shouldn’t select the cheapest option available if you want your topper to last a while. Temperature: Memory foam toppers tend to retain heat more than other materials. The denser and thicker they are, the hotter they can get, although cooling gel can help. Of course, the type of bedding you use with your mattress is also going to have a major impact on how warm your bed feels. Flannel is much hotter than cotton, for example. Odor: When it comes to memory foam, off-gassing isn’t uncommon. This scent, which has been compared to a “new car smell” will go away with time. If you’re sensitive to chemical smells and are bothered by this odor, just leave your topper out in a room with open windows and it should be gone within a couple days. While a quality mattress is the most important factor of all for sleep quality, a mattress topper can definitely help. While they don’t cost a lot, they can help with getting good rest and serve as a placeholder for a new mattress. Then, when you can afford it, you can buy yourself an entirely new bed. Hopefully, this guide was helpful in making your mattress topper shopping easier.